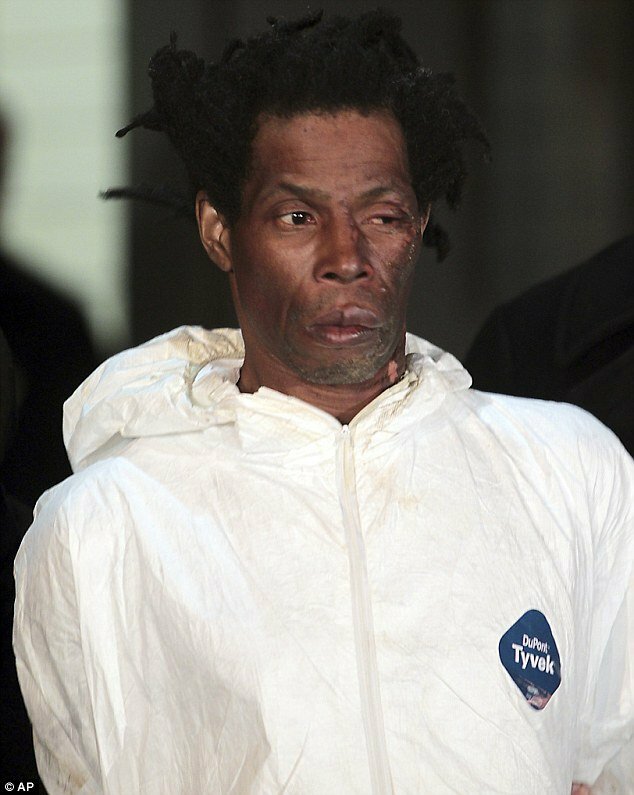 Jerome Isaac, the man accused of burning a 73-year-old Delores Gillespie to death in the elevator of her Brooklyn, New York, apartment, appeared in public for the time since his arrest today – revealing a visibly singed face. New York City police arrested Jerome Isaac, 47, who they believed doused his former employer with gasoline before setting her on fire in an elevator. Jerome Isaac is reportedly a disgruntled handyman who was angry over a $2,000 unpaid bill. He was charged this afternoon with first-degree murder and arson, hours after he turned himself in to police reeking of gasoline with the entire left-side of his face clearly singed by flames. Police say Jerome Isaac waited for Delores Gillespie to return home from shopping. When the elevator door opened, he sprayed her in the face and across her body with gasoline and set her on fire with a Molotov cocktail. The elderly woman cowered in the corner of the elevator and tried to shield herself, but neighbors say they heard her screams of agony as she burned to death after her alleged killer fled the scene. The brutal attack seemed to be all over Jerome Isaac’s unpaid bill after he worked for Delores Gillespie as a handyman, the New York Post reported. The fatal bill: $2,000, according to police. Jerome Isaac had lived with Delores Gillespie while he worked for her doing odd jobs. When Delores Gillespie found out Jerome Isaac was stealing, she fired him, Rickey Causey, the victim’s 52-year-old nephew, told the Post. “He was doing more stealing than cleaning,” Rickey Causey said. Jerome Isaac left a note on Delores Gillespie’s door demanding payment for chores he had done, but the elderly woman didn’t want to pay him after she caught him taking things from her, Rickey Causey said. The horrifying attack lasted one minute and was caught on two surveillance cameras at the 203 Underhill Avenue apartment block. Delores Gillespie, who had just returned from grocery shopping, turned and crouched in an attempt to protect herself, according to police. Jerome Isaac, who was wearing a protective mask on top of his head, sprayed her directly in the face and over her head and body as she retreated to the back of the elevator. Caught on camera is a still from surveillance video allegedly shows a man, now identified as Jerome Isaac, spraying Delores Gillespie with a flammable liquid in an elevator. Jerome Isaac then pulled out a barbeque-style lighter and used it to ignite a rag in a bottle. The attacker ran away, using the apart block’s staircase, leaving the woman to die in agony. Delores Gillespie, who neighbors believe grew up in Louisiana and suffered a mental illness, was pronounced dead at the scene. Police said they believe Jerome Isaac had been waiting for Delores Gillespie to return home. “It was apparent he knew she was on the elevator,” New York City police spokesman Paul Browne said. Firefighters and the police arrived at the apartment block at 4:00 p.m. after residents reported fire and smoke – but remained unaware of the elevator horror. “I’ve never seen any s*** like this, and I’ve been doing this a long time,” an unnamed detective added. Delores Gillespie had often complained other tenants were stealing from her – yet neighbors believe she was simply paranoid.